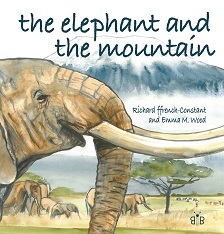 This colour-illustrated story book is recounting the life of elephants in East Africa and how they are affected by climate change. The illustrator Emma Wood has created a beautiful colourful world of animals and plants. The water flowed endlessly from the mountain and life was good. Vast herds of elephant came every morning, wallowing all day in the mud and sometimes chasing away myriads of colourful birds. But day by day, week by week, and year by year the snow steadily vanished from the mountain.